The Big Ten Network is the official provider of Big Ten Conference athletic events. Launched in 2007, BTN is a joint venture that is owned and operated by the Big Ten Conference and Fox Sports. BTN currently reaches over 50 million households in the US and is based in Chicago. BTN is on the air 24 hours a day offering more than 350 live events on the TV channel and streaming over 400 additional events in high definition. The BTN programming schedule consists of 40 live Big Ten football games, 105 Big Ten basketball games, the Big Ten Basketball Tournament games, and hundreds of additional Big Ten Conference sporting events and championship events. The Big Ten Network has distribution agreements in place with the ten largest providers in the US including Charter Communications, Verizon, Bright House, AT&T U-Verse, Comcast, DirecTV, Dish Network, Time Warner and Cox Communications. BTN coverage reaches nineteen of the twenty largest media markets in the country. Watch Big Ten Football Games Online – Get streaming online access to your favorite Big Ten football team’s football games. Every Big Ten Network football game will be available on BTN2Go. If BTN is has three games on at the same time, but there are only two on TV, you can find the other game streaming on BTN2Go. 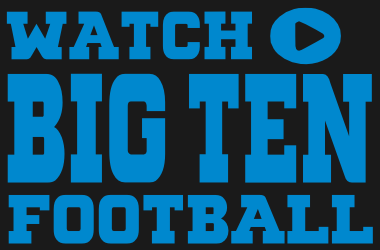 BTN…Watch Big Ten Football Online at the Big Ten Network – the official digital media provider of the B1G. BTN2Go…Live Big Ten football streams to your computer, tablet, or cell phone. BTN2Go International…Watch Big Ten football games online anywhere in the world. BTN Facebook…Award winning programming such as The Journey and Big Ten Icons. Big Ten Network on Twitter…Official twitter feed of the Big Ten Network. Big Ten Network on YouTube…Destination for Big Ten fans and alumni across the country. Also, sometimes football games are aired back to back on BTN, if the first game goes over its time limit when the second game starts, fans can get the other game on BTN2Go. Never miss another second of your favorite Big Ten games. Big Ten Football Radio Online – Listen to live Big Ten football streaming online radio broadcasts for free. BTN2Go – A live online extension of the Big Ten Network giving fans the opportunity to watch Big Ten football, basketball, and more online through the Internet, on cell phones, or mobile devices. With BTN2Go, fans can watch Big Ten football games online, BigTen Basketball games online, and over 18 other sports, all online. BTN2Go is offered through all the major cable companies that carry the Big Ten Network and is part of your subscription package when you order BTN, so there is no added cost for BTN2Go when you have BTN. Big Ten Digital Network – VIP subscribers get high definition streaming audio and video from all 14 Big Ten members. Get over 500 games streamed online from the Big Ten Network. BTN International – The digital arm of the Big Ten Network delivering on demand content to subscribers living outside the US, in Canada or the Caribbean. Watch BTN2Go online over the Internet, on cell phones, smart phone, tablets, and mobile devices. Subscribers get a 24/7 feed of BTN, watch all Big Ten Network football games online, access to historic games, and tons of original programming. As a bonus, no other sports network gives nearly as much coverage to women’s sports as the Big Ten Network. Every year BTN produces over 500 women’s sports events: including basketball, hockey, golf, lacrosse, rowing, soccer, softball, swimming, diving, tennis, track and volleyball matches. In fact, in the past year the Big Ten Network grew 20 percent over last year with nearly 550 women’s sporting events.